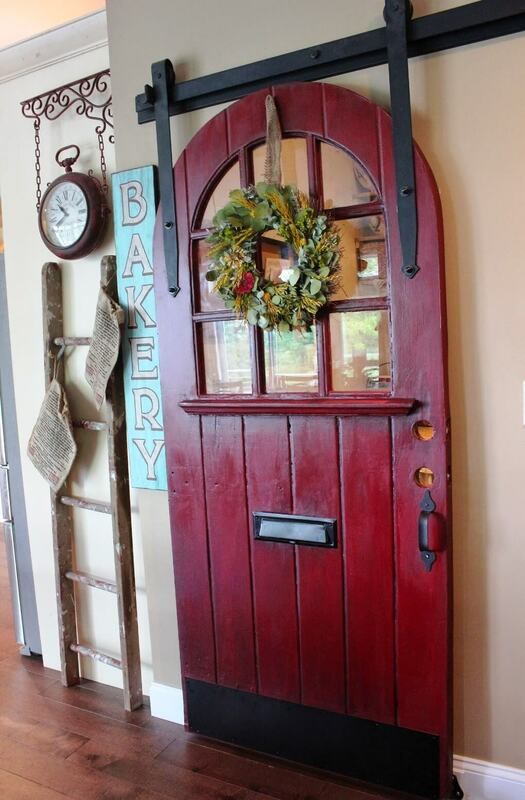 Whether you want to salvage an adorable arched entry door fit for an elf’s cottage or an elaborately carved architectural panel door fit for a king’s dressing room, there are many great repurposed old door ideas to be found. Detached doors abound because the craftsmanship of yesteryear produced specimens that were built to last. 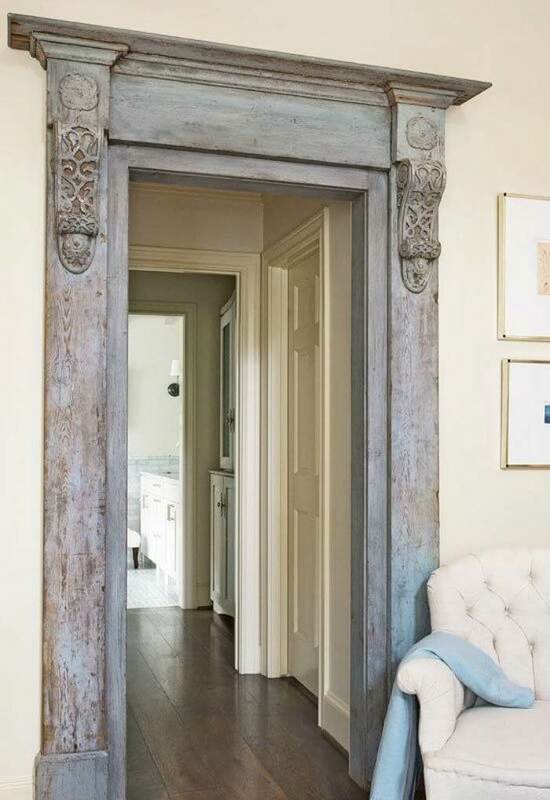 Sometimes a quality door long outlasts the home or room it once adorned. Other times, beautiful doors are no longer functional, but the owners hate to part with them. Countless vintage doors that have been separated from their original homes end up in antique shops, where collectors snap them up. 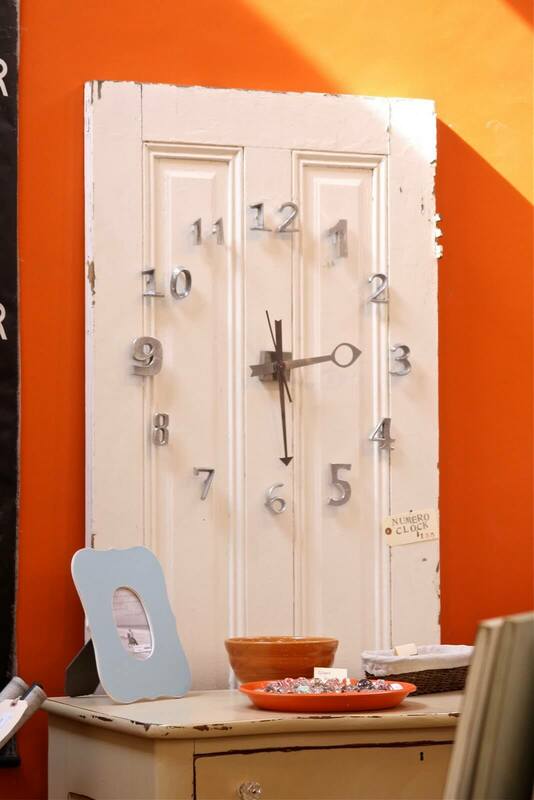 Many door hunters are also DIY enthusiasts who are eager to realize all their repurposed old door ideas. Old doors can find new purpose as interior doors, freestanding room dividers or even as rebuilt furniture and shelving. Adding a vintage door to your home design adds character and function. 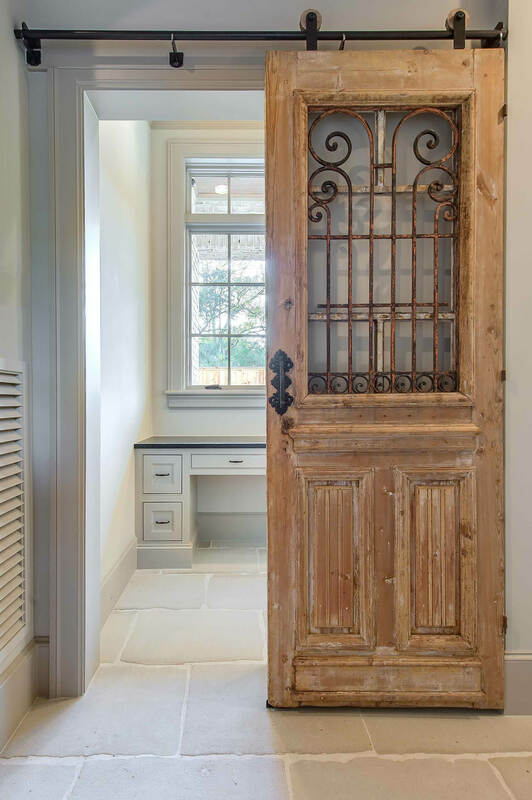 If you have a vintage door waiting for a new life, check out this curated collection of repurposed old doors to spur your imagination. This is a unique idea for replacing the average pantry door. The old front door was repurposed into an eye-catching barn door red sliding pantry door. The pop of color will make it the focal point in a room painted in more neutral tones. The door also creates interest with its rounded top and original mail slot. The windows allow natural light to filter through when a solid door would not. Vintage door reinvented as a vanity letter writing desk, and storage area. 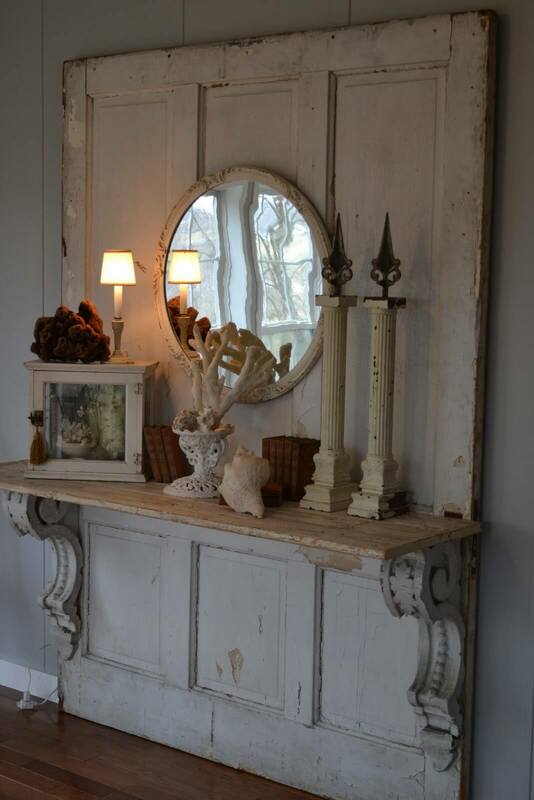 The oval mirror adds to the antique feel as does the deep color and distressed paint. The wrought iron brackets add to the vintage farmhouse look while also holding the desk and wire basket in place. The desktop, basket, and shelf added on top of the door provide storage or space for other farmhouse decors. 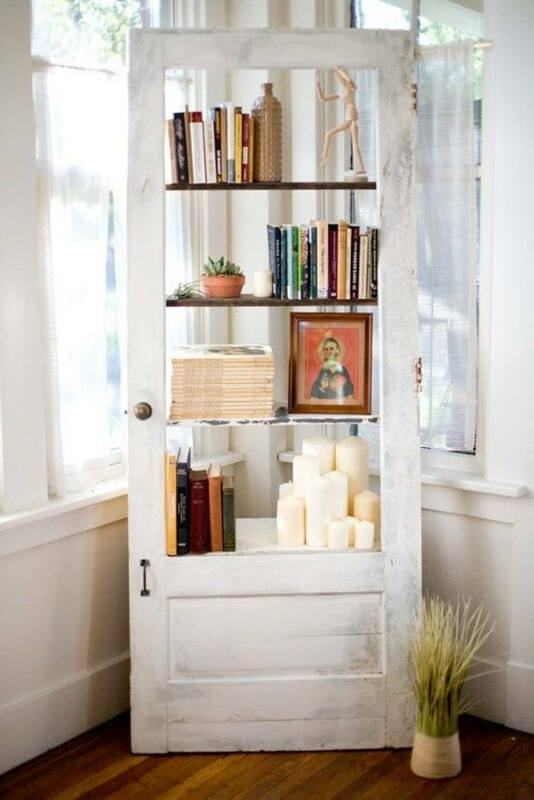 By adding shelves where the glass panes once were, this discarded door has been turned into a beautiful corner bookshelf. The original hinges were left intact and the paint is distressed to keep the vintage look of the door. A unique way to extend the farmhouse style in an unexpected and creative way. Once a stable door, now repurposed to resemble a mantle. The original paint was preserved and left peeling and cracked for a true vintage feel. The door was secured directly to the wall and a display shelf adds to the mantle look. The oval mirror reflects the light and the shelf can be decorated to suit the style of the house. 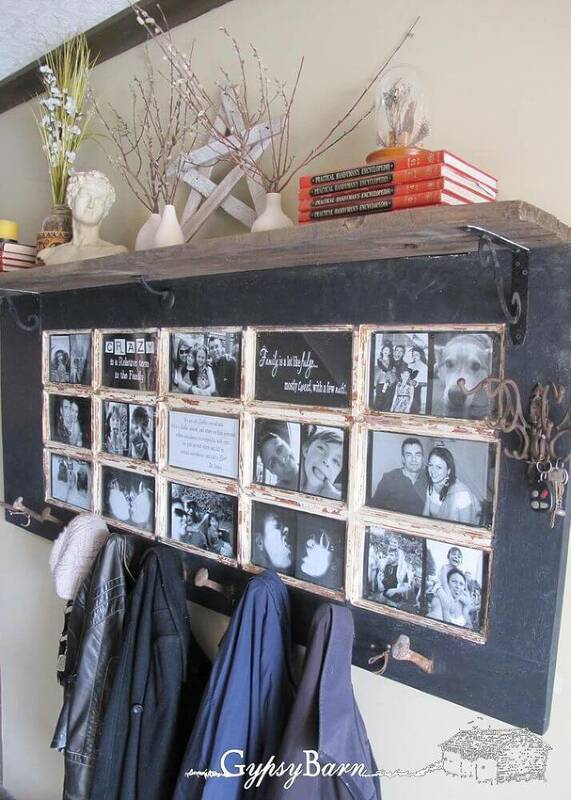 An old door turned sideways is transformed into a picture frame and coat rack that is fun and functional at the same time. The pictures and quotes are framed where the glass panes once were in the old door. A shelf has been attached at the top in order to display more pictures or decorations. There are convenient key hooks on the side and coat hooks at the bottom. This is perfect to have near the entryway because it offers easy access to the things your family needs as they leave the house. 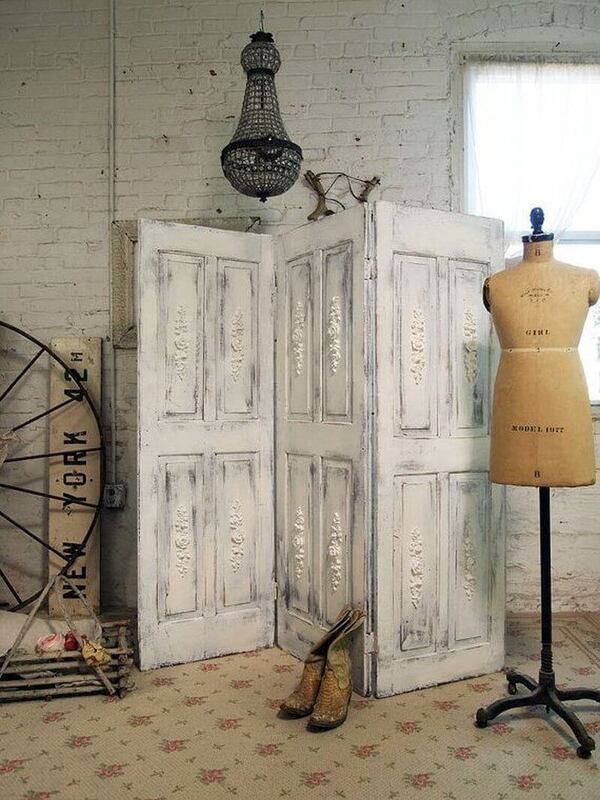 Embellishments at the top of this repurposed door give it a Victorian feel. The bottom panel has been replaced with a full-length mirror. This will add charm and functionality to an entryway, bathroom, or bedroom. The original hinges were left intact and the distressed cream color paint is neutral in order to blend into any color scheme. 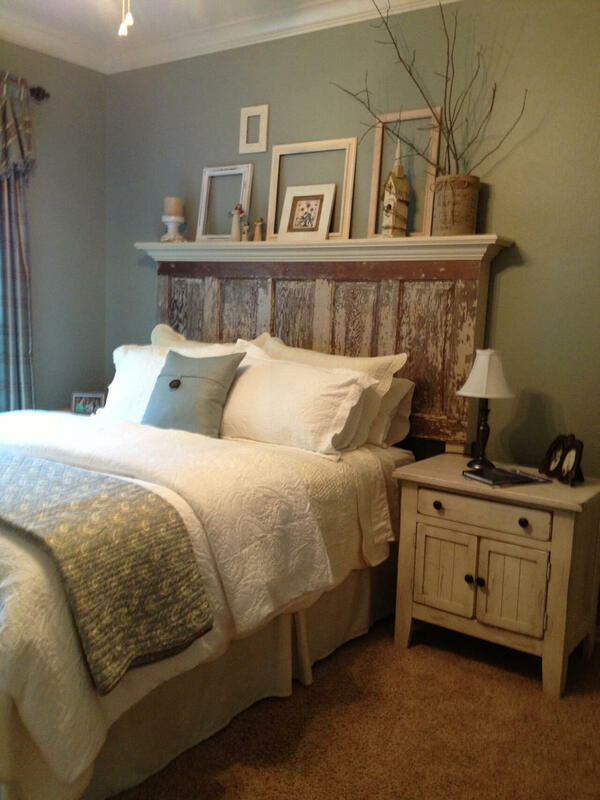 Sanding down and refinishing an old door to create a unique headboard is another way to repurpose and add style as well as personality to your bedroom. A shelf has been added to the top of this door to display decorations. The distressed paint in neutral colors will fit with just about any paint color scheme you have chosen. 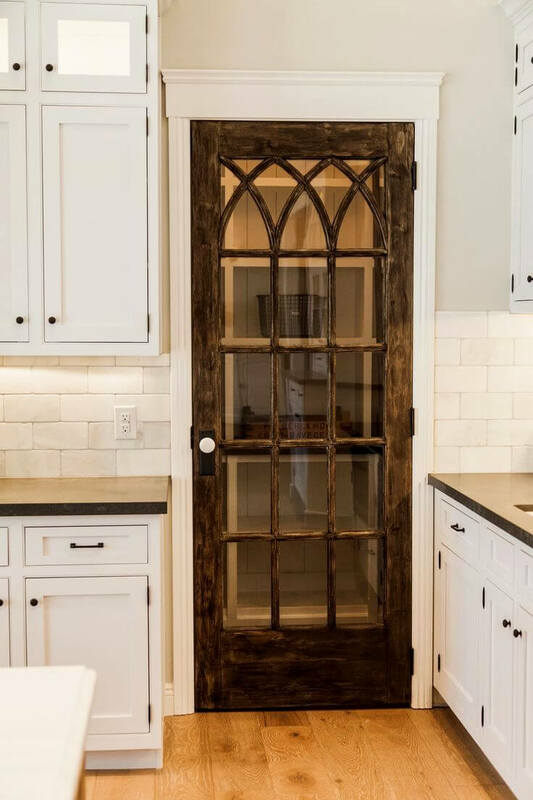 This Gothic lattice door refinished to be used as a pantry door is stained dark brown to enhance the wood grain. The glass panes are decorative and allow a glimpse into the pantry itself. The glass also allows for light to filter through and adds a unique flair to an otherwise run of the mill pantry entrance. 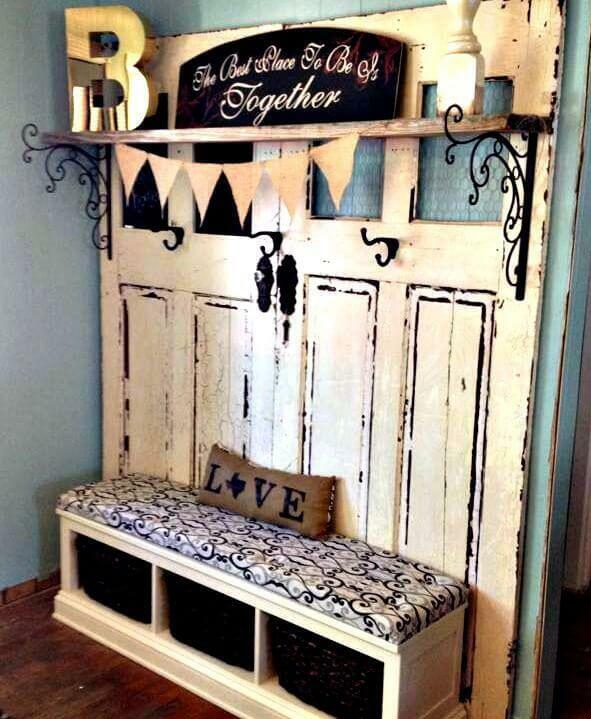 Innovative creation of a rustic garden bench using an old door. The seat is attached to the actual door hinges and wrought iron armrests add to the look and comfort of the bench. The distressed paint adds to the vintage look and the bench would need to be treated to withstand the weather. 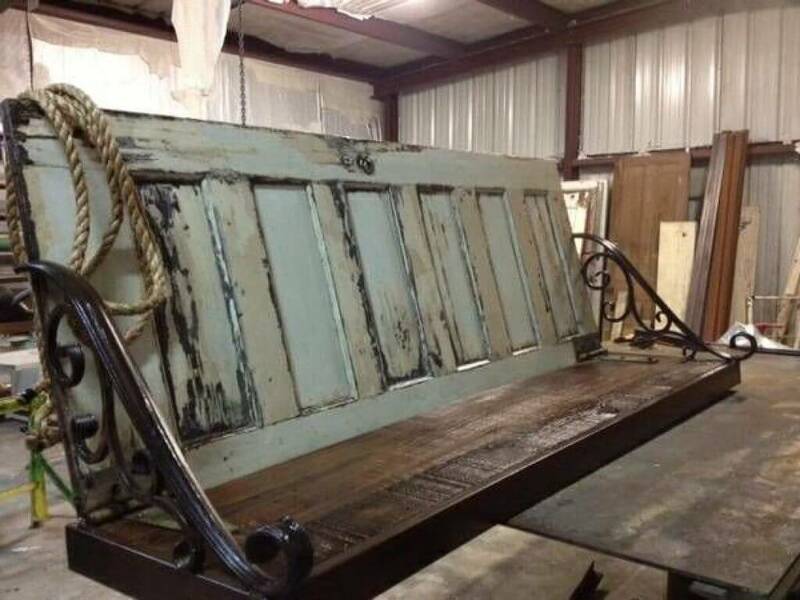 A salvaged crawl space door was turned into a coffee table. The added shelf on the bottom offers some storage space for books, games, or extra throw pillows. Wheels have been added to the bottom of the table to make it easier to move if needed. Distressed paint adds to the vintage look of the portable coffee table. 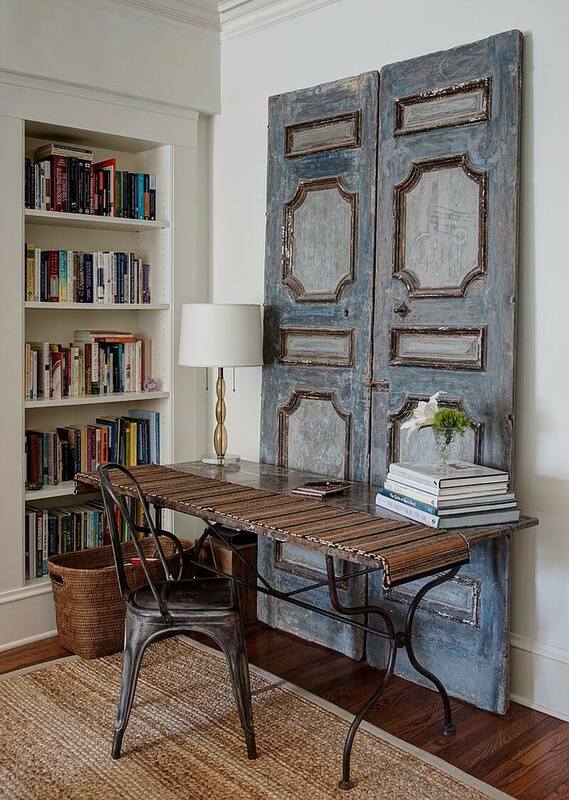 Beautifully wrought iron scroll door was turned into a sliding office door. The rust was left on the wrought iron to add to the vintage feel of the door. The stripped look of the wood reveals the imperfections and amplifies the antique look. Make the doorway to any room more interesting with this richly embellished Victorian door frame. Intricate scrollwork on top and refinished to show off the original wood. Makes the entrance to the room a focal point as well. This Victorian door frame adds elegance to your home design and decor. Turn an unused corner of the house into a charming seating area or reading nook. A bench has been added to the bottom of the bench while the original glass and doorknob were preserved. Decorative swag adds a touch of whimsy as do the throw pillows. The distressed paint is in keeping with the farmhouse vintage decor. Partition off a home office by hanging French door panels from the ceiling. This designates the space as a work area without turning it into a cramped and dark office. The doors allow for natural lighting and allow the office to be as stylish and inviting as the rest of the home. You can be productive without being closed off from the rest of the house and what’s going on. 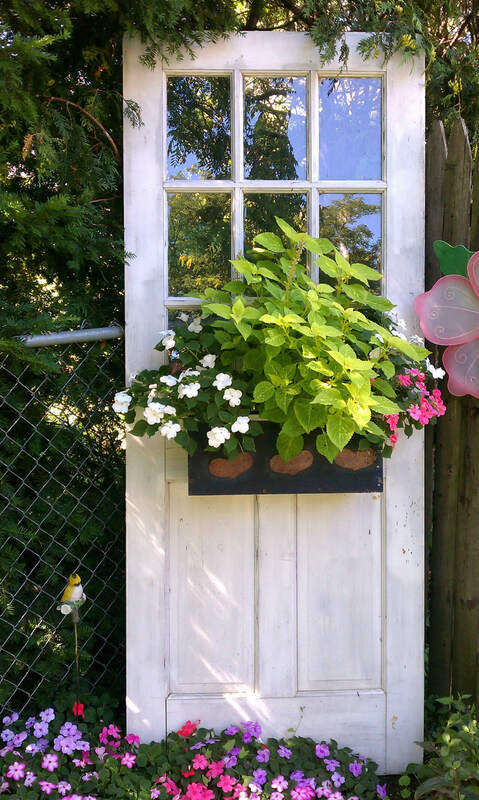 Add to your garden or porch by repurposing an old door into a decorative planter. Make sure to use outdoor paint or treat the door to protect it from the weather. Attach pots to the window frames and plant seasonal flowers to enjoy year round. 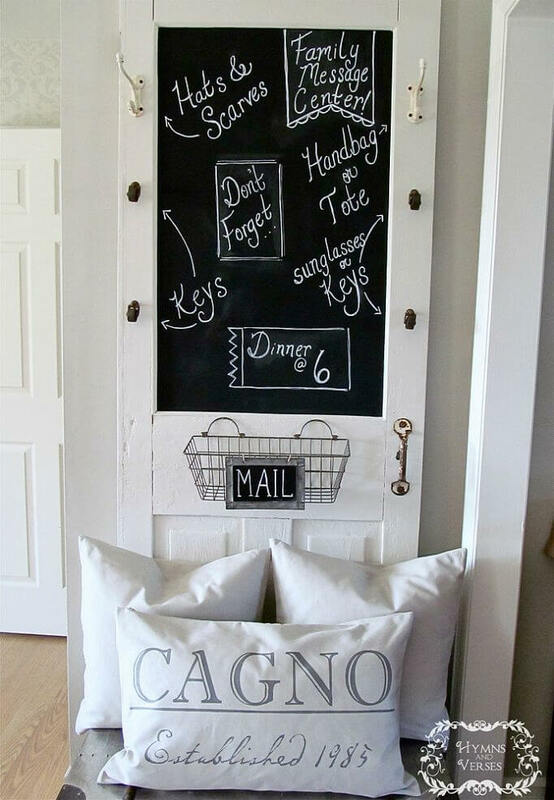 Transform an old door into a fun and functional family message board using chalkboard paint. Added hooks for keys or sunglasses and a wire basket for mail add to the functionality. A bench has been attached to the bottom for putting on shoes or taking them off at the door as well. 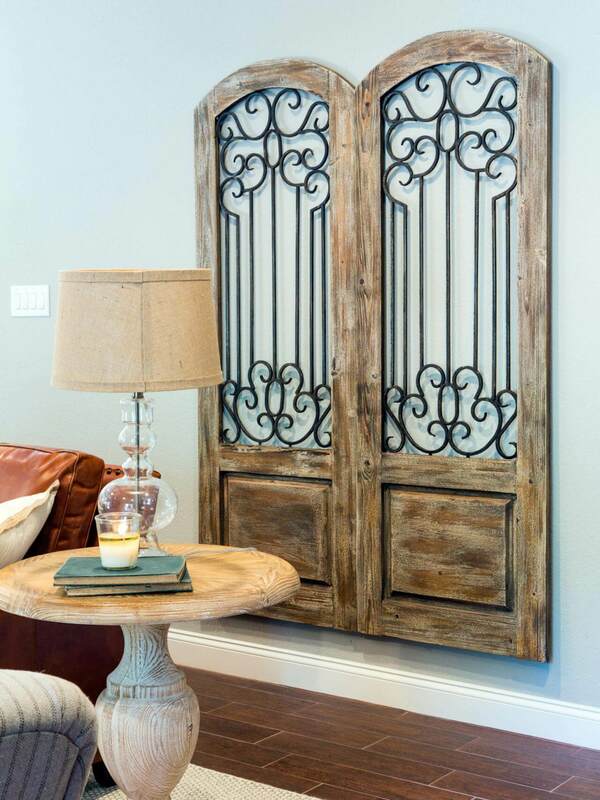 This salvaged door was turned into a lighted display great for a foyer or even living room. You can keep the original doorknob or add one to match your decor. Distress the paint to preserve the vintage feel of the rescued door. The two shelves are perfect for displaying family photos, books, or flowers. Bi-fold doors turned into a corner shelf for any unused corner of the house that needs a little sprucing up. The shelves can be used to show off photos, store books, or even display fresh flowers. Retain the antique doorknob if possible and even the original paint depending on how damaged the doors may be and your color preferences. The doors can be sanded and repainted with a distressed look to fit your style. 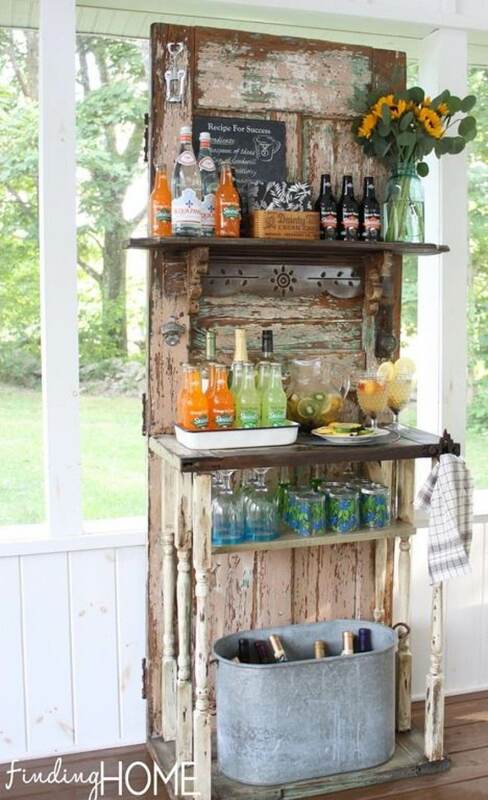 Use a repurposed door to create a refreshment stand for outdoor entertaining with vintage style. The shelves can hold an assortment of beverages for those spring, summer, and even fall outdoor cookouts and bonfires. The bottom shelf can hold an ice bucket and everything guests need to get a drink is in one central location. 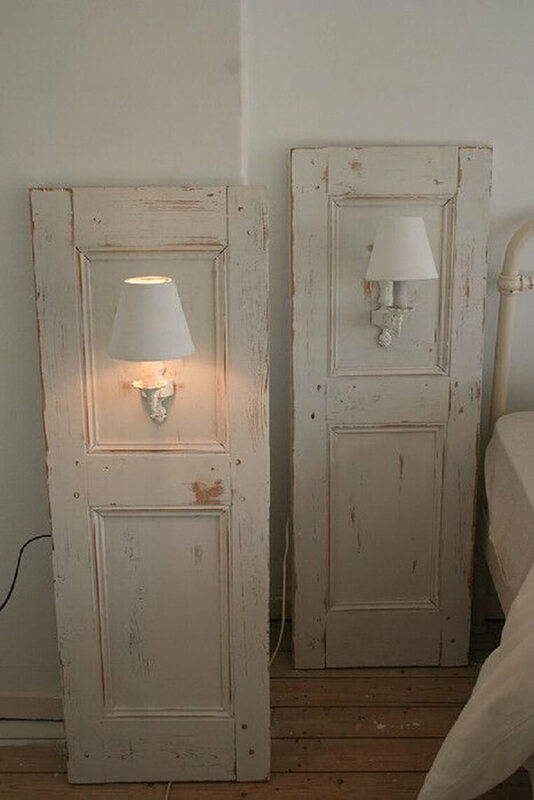 Transform old shutters into white-washed wall sconces. These are perfect for a bedroom or living room to add soft lighting and vintage style. Add a little flare to traditional wall lighting with the repurposed shutters. Fun, functional, and unique these old shutters will fit perfectly with almost any decor. 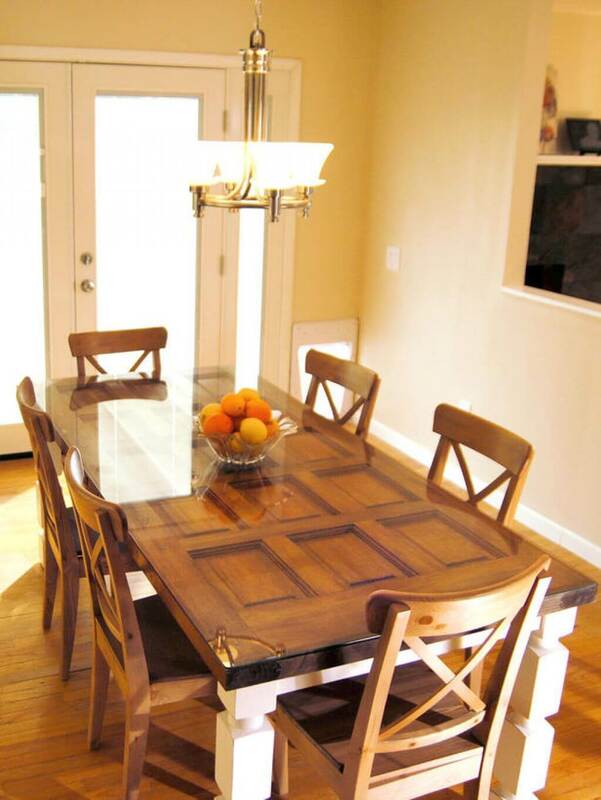 A twelve-panel door is turned into a glass topped dining room table. This classy dining table retains its vintage farmhouse feel in the whitewashed distressed legs that have been added. This is truly a sophisticated repurposing of an old door. The glass top protects the wood from spills and stains. 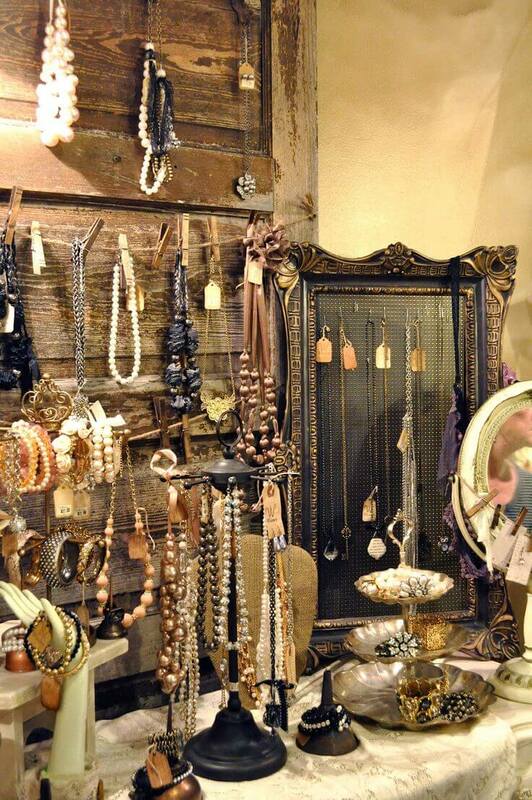 Trade in the traditional jewelry box for a repurposed barn door transformed into a jewelry stand. Your beautiful pieces of jewelry can be showcased even when not being worn. Twine has been strung from nails on either side of the door and clothespins are used to attach necklaces for display. Other pieces are displayed on the shelf as well. Everything you need to grab when leaving the house organized using a repurposed door. 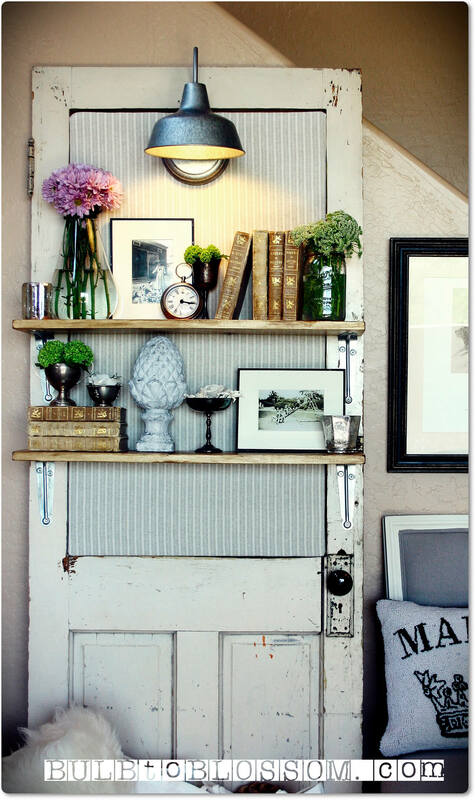 Old shutters were used as well to create the shelves at the bottom handy for storing shoes. Hooks on the side will keep keys easily available and the mirror is nice for checking your appearance one last time before leaving. Four repurposed doors create a sheltered garden seating area. 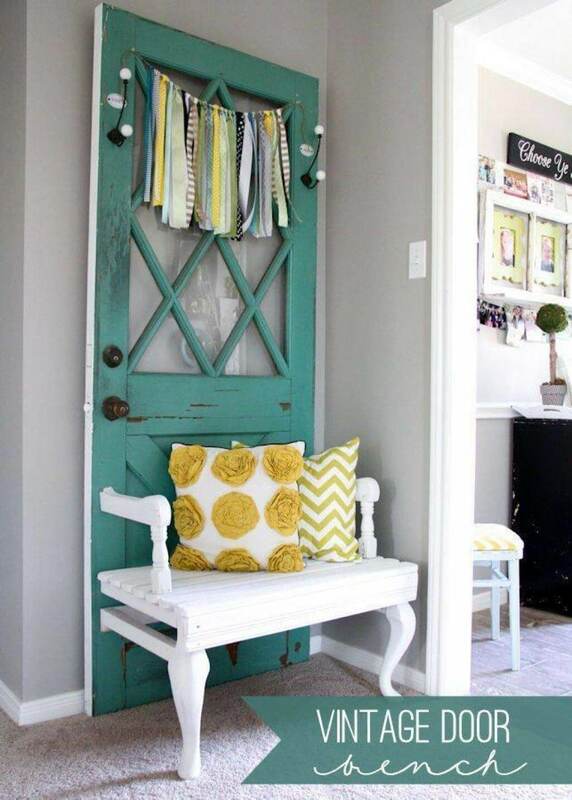 Create a cozy corner of a patio or garden using four old mismatched doors. Add a table and chairs or a bench to relax on and enjoy the nice weather and your beautiful garden. Make sure to weatherproof the door appropriately so they will withstand the elements. 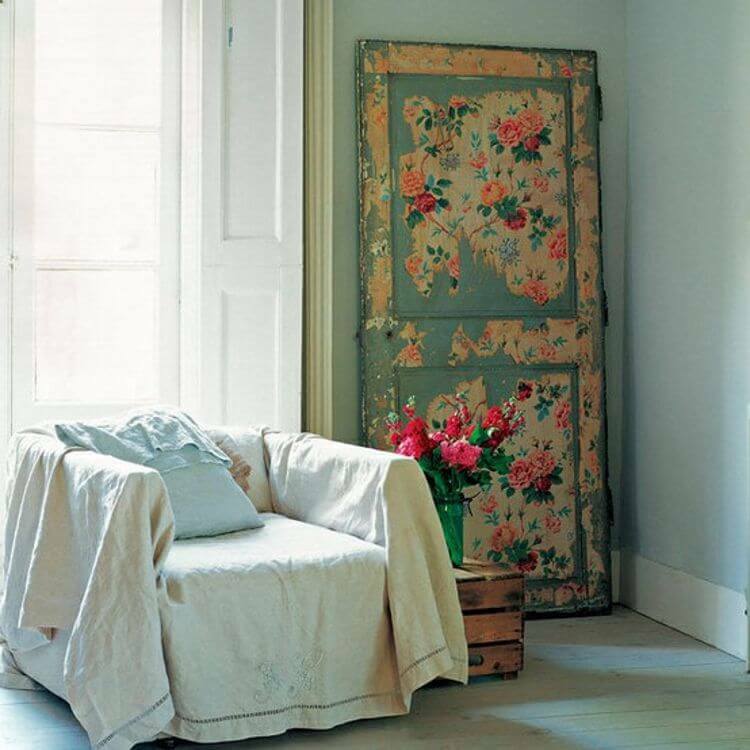 Create an old-fashioned dressing screen or even a room partition made from three old doors. The distressed paint and decorative wood embellishments add a dramatic effect. Can easily be an addition to any decorating style in a bedroom or large bathroom. 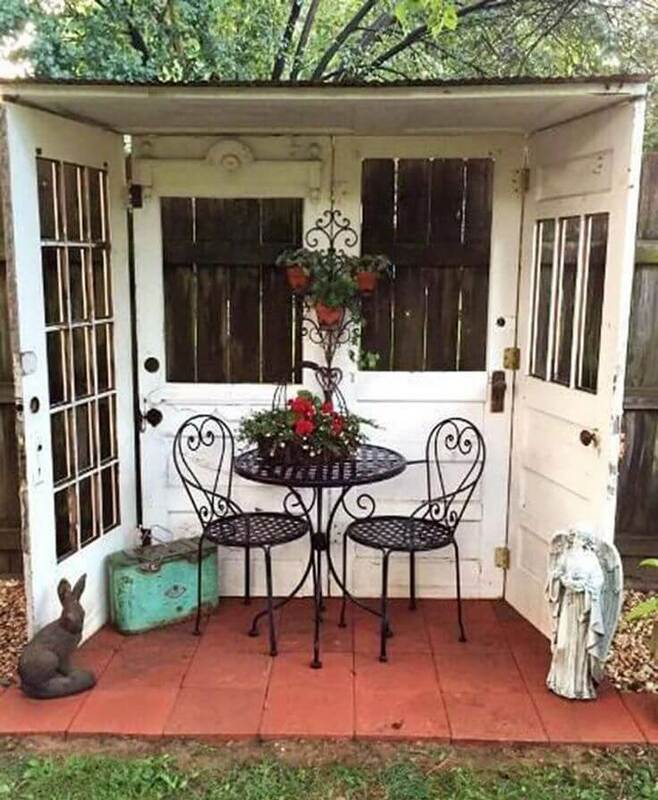 Use a repurposed door to create a unique decorative touch to our garden, patio, or porch. This freestanding door has retained the original window panes and has an added flower box for seasonal flowers year round. 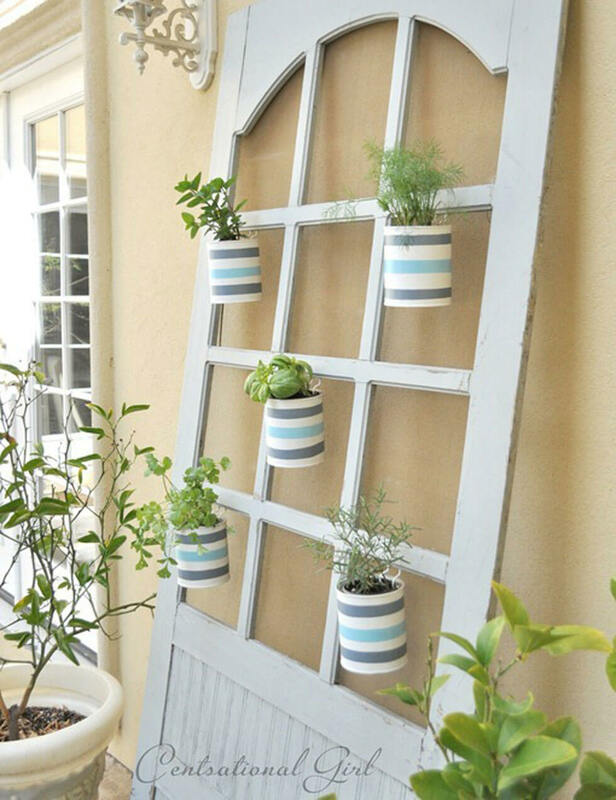 Spruce up a corner of your garden or porch with this creative use of an old door. Decoupage an old door for a faded antique look. It appears that the door has peeling paint revealing other layers underneath. This Victorian look would be perfect for a bedroom or even a den or library. The decoupage adds to the appeal of the old door. Functional and unique this door has been transformed into the perfect addition to an entryway. The chalkboard is a great place to leave messages for those coming and going. There is a convenient key hanger and storage in the cabinet underneath to neatly tuck away shoes or even scarves and gloves. Double glass-paned doors create an attractive and functional room divider. Use this idea to create a small office space, reading nook, craft area, or even sewing room. The glass window panes allow for light to flow through and don’t give the space a dark closed off feel. You can still be a part of the household activities while being slightly separated to work. 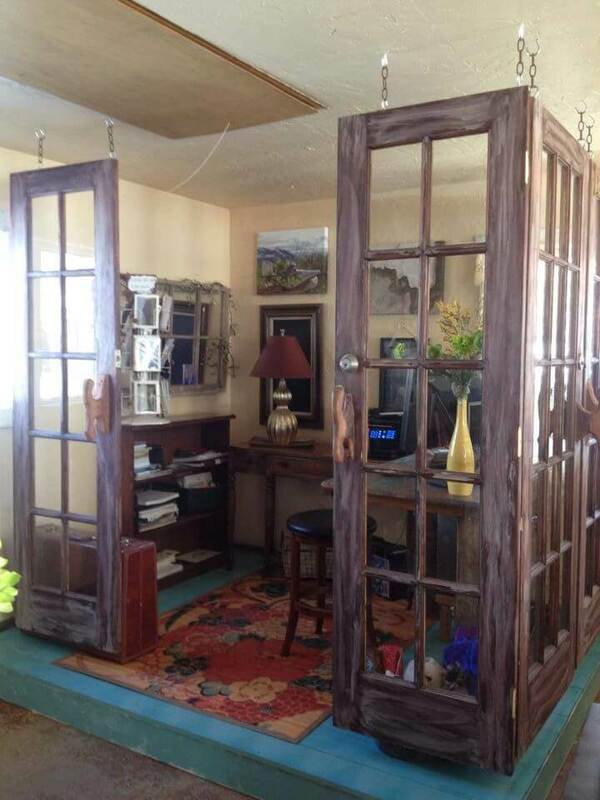 Unique wall art has been created using arched cabinet doors. The wrought iron scrollwork looks beautiful against any wall color you choose. The wood has been stained to showcase the original wood grain instead of covering it with paint. Perfect for any wall in the house that needs a decorative touch. 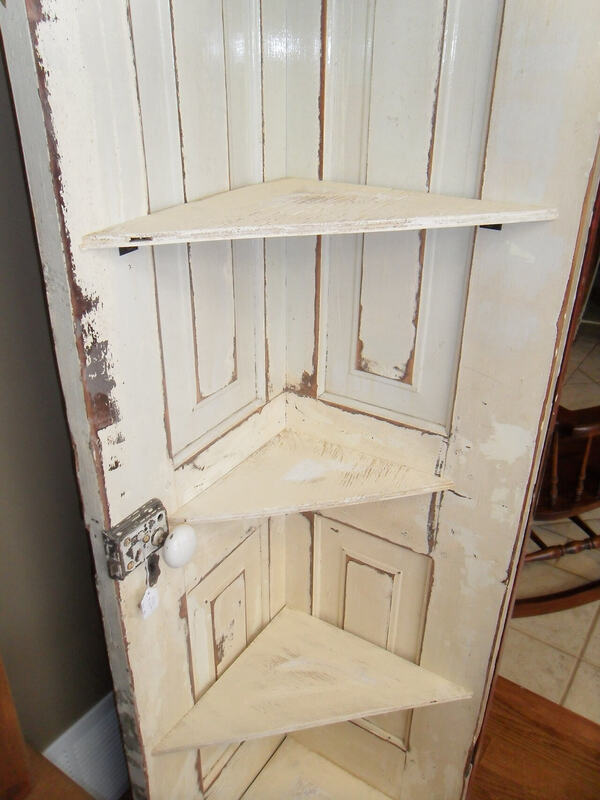 This repurposed pantry door is being used as a desk topper. The clock helps you keep track of time as you work. 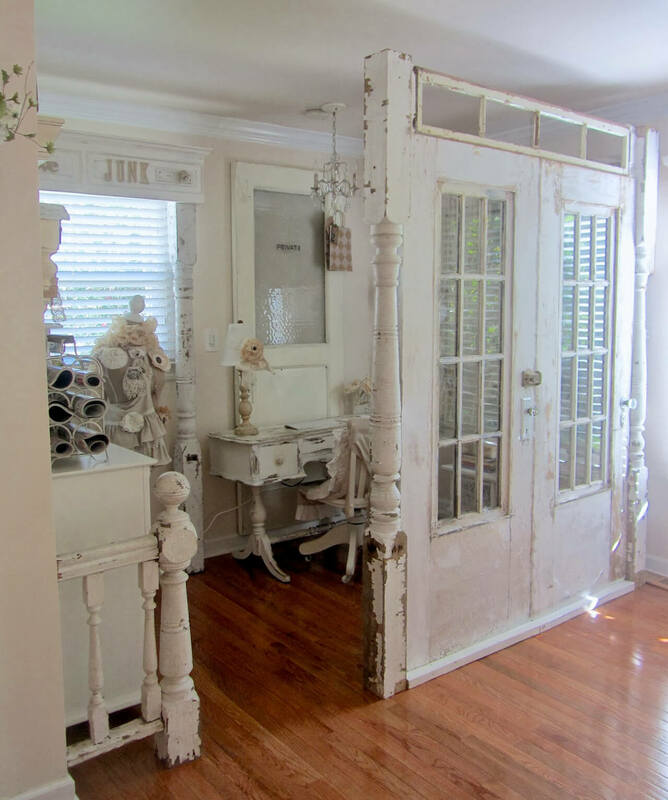 The door and desk have been painted in a distressed white paint to match any room or type of decor. Fun and creative workspace for a student. Add a vintage farmhouse table style chair to continue the look. 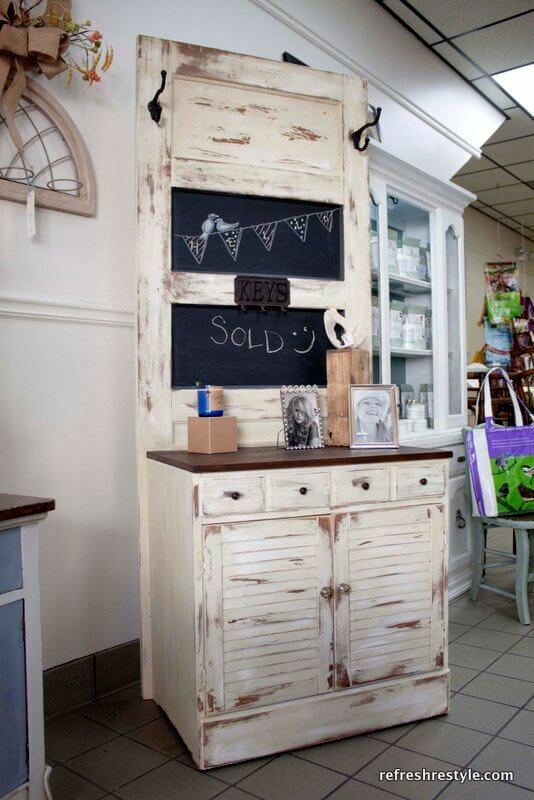 A beautiful addition to a foyer or entryway created by using old stable doors. The doors have been refinished and coat hooks added. The shelf at the top is great for displaying decorations, photos, or flowers arrangements. The bench is perfect for putting on or removing shoes and the baskets in the cubbies underneath are good for storing scarves, hats, or gloves. Panel doors have been repainted in a dramatic blue to make it a focal point. Used as a backdrop for a desk the doors are a creative and decorative effect against a neutral wall. The glass-topped desk is offset by the use of the doors behind it on the wall.